I'm so happy Martha found a US source for these fantastic linens from Spain. I first spotted them at Merci (which I'm discovering is a mecca for all things uber-fabulous), but couldn't find a way to purchase additional sets and colors here in the US. I can't express enough how wonderful they are for entertaining! 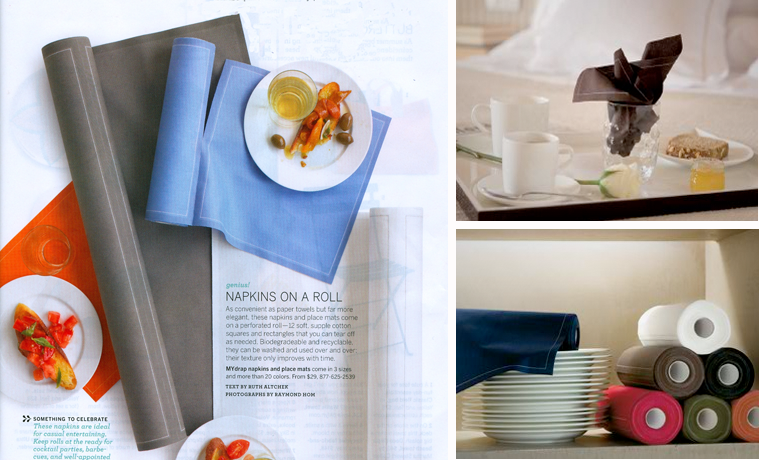 This is how MYDrap works...the linens come on a roll, and have perforated edges for easy tearing. They are hemstitched and look really fancy, but the price tag isn't. The linens can be washed and reused as well; and they don't wrinkle up like crazy either. Oh, and the colors are amazing. See them for yourself here. Martha says to call 1-877-625-2539 to order. p.s. for another closeup on those pretty blue napkins, click here. Not that I'm heading to Madrid, Barcelona, or Seville any time soon, but still. It would be pretty cool, don't you think? Just sayin'. I so you have loved to had these at our cook out the other night. Casansa is more than happy to provide the western hemisphere with the renaissance man of napkins. Mydrap is colorful, yet elegant! We are very glad to see that you enjoyed your purchase. Please feel free to stop by www.casansamydrap.com to check out any other colors, or just to learn more about mydrap.